Campus Technology's first-ever Teaching with Technology survey found that faculty have an overwhelmingly positive outlook on tech in the classroom. Higher ed loves technology. In a survey of faculty at U.S. colleges and universities, four-fifths of respondents (81 percent) reported that tech has had either an "extremely positive" or "mostly positive" impact on education. Only a single individual among all 524 respondents said just the opposite. These insights and more were part of Campus Technology's first-ever Teaching with Tech survey, which polled faculty members across the country about their use of technology for teaching and learning, their wish lists and gripes, their view of what the future holds and more. Respondents also shared a lot of open-ended opinions about what works and doesn't work for them in their lecture halls and learning spaces. Most respondents were upbeat about technology's value in the field. As a humanities professor in Georgia proclaimed, "Technology is making education magical. We have the ability to engage each student one-on-one." At the same time, added another instructor from a community college in Ohio, "Technology is too advanced for many adult learners and creates a barrier to learning and teaching. Let's hope the power never goes out." 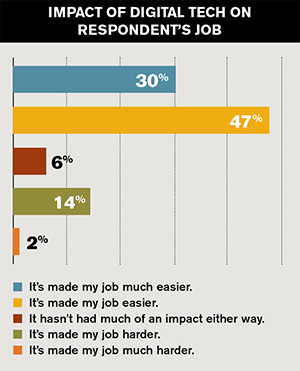 Similar to their overall positive view of technology's impact on education, nearly as many respondents (77 percent) believe that tech has made their jobs easier. However, in contrast to the previous question, many more people (16 percent) also said tech has made their jobs harder. A humanities teacher in a New Jersey community college noted that while tech may make education (and life) easier, it won't replace certain basic teaching skills, such as writing instruction. "Student writers need to develop voice, gain information literacy, learn grammatical consistency and enhance critical/analytical thinking skills," he said. "That won't change even as the mode of education shifts to incorporate more technology in the education process. All the gamification and MOOC-ifying of education won't change the basic structure: Students write, writing instructors and peers provide feedback, students revise." Difficulty of the job doesn't seem to have dampened instructors' enthusiasm for technology. Almost nine in 10 (88 percent) reported that tech has positively impacted the effectiveness of their teaching. Another 11 percent are neutral on the question, and just 1 percent believes tech has had a negative effect on their ability to teach. Educators are nearly as affirmative on tech's impact on student learning. Most people (84 percent) believe the use of tech has positively affected learning. Yet, compared to the tiny number of "negative" responses in the previous question, about five times as many people (6 percent) also believe that tech has negatively affected their students' abilities to learn. Several respondents reminded us that one population is often left out of conversations about the benefits (or lack) of technology in teaching and learning: students with disabilities. "Clickers, YouTube, etc. are largely inaccessible to students with sensory impairments," stated an adjunct professor at one Florida college who also runs the disability services at another college in her state. "Colleges are waking up to the fact that technology that is not accessible is a liability to them under the federal regulations," she said. To counteract the imbalance and potential liabilities, faculty members where she works are beginning to invite the disability office staff in to review technology and ensure it is accessible before voting to accept it or not. The full results of the Teaching with Technology Survey appear in the August/September digital issue of Campus Technology. Highlights from the survey will also be posted on this site over the coming months. You can check back for ongoing coverage in our Research section. There are a lot of people who play a part or have a vested interest in the use of technology in colleges and universities. But for the sake of this survey, CT wanted to find out what faculty thought about the topic, so we targeted our questions to that role within the institution. Everybody else who responded to the survey was eliminated from the results we're sharing with you here. We were left with 524 qualified participants who held faculty roles. Of those, 69 percent work in public institutions, 23 percent in private not-for-profit colleges and another 8 percent work in private for-profit schools. Seven in 10 institutions (71 percent) run four-year programs; the other 29 percent run two-year programs. Our typical respondent has spent an average of 21 years in the field. Nearly half of the respondents (49 percent) have 21 years or more of experience working in higher education; the next largest group (33 percent) has between 11 and 20 years. The respondents come from a gamut of school and college types. The top three most represented are education (19 percent), business (14 percent) and liberal arts (10 percent). Every other discipline has single-digit representation. The average size of the institution's student body in our survey is 13,886. However, nearly six in 10 respondents work in colleges or universities with fewer than 10,000 students.